How do you pick out the perfect Buddha? The #1 rule when choosing your favorite Buddha is – Buddha chooses you! It’s all about the expression – the eyes and the face. Kind eyes. Calm expression. Buddha pulls you in, he calls you out. 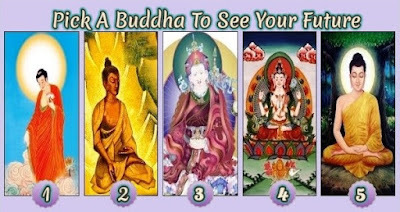 Each Buddha picture has its own unique utterance and this is the secret to the Buddha picture. Choose your favorite Buddha to reveal your future, how to improve it and find true happiness and receive a positive Buddha Message. You have your feet on the ground and you are very affectionate with your loved ones. You are a calm and reasonable person. You seek balance in any situation and extremes make you feel uncomfortable. You are concerned about your own image, but you are not superficial at all. Soon your love life is going to see a huge development. If you’re single, you’re going to meet someone. If you’re dating then that relationship is going to go up a notch. And if you’re married then a new chapter is starting in your marriage! Buddha Message for you: Know well what leads you forward and what holds you back and choose the path that leads to WISDOM. You are independent and have a very strong personality. Nothing seems to make you shiver or make you angry. You prefer to deal with things on your own and you dislike the idea of asking for help from others. That’s why you are very talented and can do many things on your own. You tend to be overly cautious and don’t like taking risks in life. You should consider making some changes in your life Now is the moment to make that change. If you do so, you will discover that the trajectory of your life will shift and become even more amazing!!! Buddha Message for you: No matter the path you choose, really walk it. You are very tolerant and support diversity, whatever it is. You are never aggressive no matter the circumstances. Your diplomatic nature helps you understand people very well. You do not want to give orders, tell other people what to do or lead someone else’s life. You are the very loyal person and would never do anything that would hurt or harm your loved ones. There’s a situation that’s been hanging over you. Your reading indicates the best way to get out of it is to tackle it head-on. Stand up for yourself and be polite but firm when dealing with the person or people involved. Believe in yourself!! This will lead to a big change that you and all those around you will love! Buddha message for you: Stay away from negative people. They have a problem for every solution. You already do so much for those around you. You are extremely giving! But to continue even further on your life journey it’s clear that you should focus more on yourself!! Show yourself more love and you’ll discover amazing things will happen to you right away! Buddha message for you: Happiness is a choice, not a result. Nothing will make you happy until you choose to be happy. You are characterized as a hard-working person, with many goals, dreams and very creative. Creativity is your main tool and it allows you to find the route and the best way to materialize all your ideas and desires. You are also very eloquent and empathetic, you can understand other people and in many cases offer them protection and tranquility. By having so many dreams and plans, you are also likely to live with great anxiety and in the midst of some emotional ups and downs. Believe in yourself more and everything you’ve been wanting lately will manifest in your life. If you trust yourself more then you’re going to see radical positive changes in your life. You can do it by just being open and honest with yourself. You have all the power you need right within you. Just tap into it. Buddha Message for You: Every morning you are born again. What you do today is what matters the most.